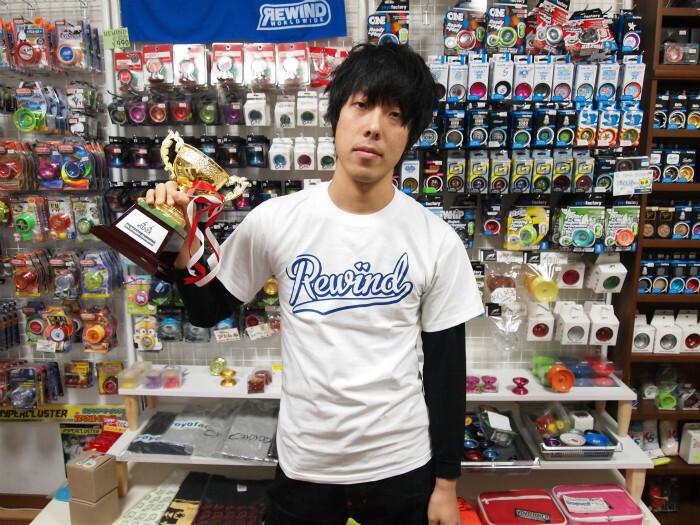 Masakazu Yamasaki of REWIND’s Promotional Team won the 2A Division at 44CLASH!! Last time (2012) he entered 44CLASH as REWIND’s sponsor seed and won the 2A Division, so this time he was seeded as the previous contest’s champion. He beautifully pulled off his second consecutive win! He usually performs as a member of beatboxing yo-yo performance unit BEAT POIN’T, so he used his performance experience and insane tricks to drive the 44CLASH crowd wild. After 44CLASH he came back to REWIND headquarters with us and the next day we shot footage for a new clip video. You can look forward to its release in the near future!